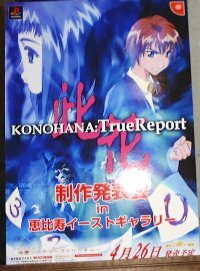 This event was a private announcement of the new game Konohana: True Report to the press. However they allowed around 40 normal people into the event. Luckily I got a ticket from a friend, so I was able to go. The strange thing was that they didn't do any camera checks, and when some of the fans started setting up the cameras and videos, there wasn't any announcement (such as no photos allowed). Then the event began. So photos and videos were allowed, even by the fans! They also passed out a Konohana T-shirt and poster to everyone. Then the seiyuu who did roles in Konohana came out. Ishida Akira (Momoi Meguru), Kawasumi Ayako (Tachinbana Miako), Asano Masumi (Asama Hitomi), Ohtsuka Mae (Kishimoto Miho), Sakurai Sara (Ishii Itsuko), Nagai Nobuko (Nagayama Shoko), Shintani Sayaka (Fujisaki Futaba), and Tsuchiya Mieko (Ohmi Yuko). The Kira Kira Melody Gakuen girls wore a white hooded sweatshirt top, and reddish (checkered) mini skirts. Then each seiyuu talked for a little bit about their own characters. Masumi: My character name is similar to mine, so I felt close to her. But this was a type of role I had never done before, and it's the first time I did a role in a mystery story. Mae: My character is a very straight forward type girl. I would like to play the game when it comes out too. Sara: My character is a quiet type character, similar to me. I like games too, so I'm looking forward to this game. Nobuko: My character doesn't have a strong presence. But she's not dark, so it was a difficult role. Sayaka: My character is a friendly, genki girl. I hope my role will add to the enjoyment of the game. Mieko: My character is a friend of Miako (main character). She is a very polite girl. It was fun doing the role. The opening song of the game is Mayoi no Mori, sung by Kawasumi Ayako. She talked a little about the song and the recording. Then she sang the song (just the first verse), after the other seiyuu left the stage. Then Ayako left the stage, and they showed a short video of the game. After the video, the producer (Mr. Kawamura) came out and talked about the game. They announced that there will be pomotional events (mini live and talk) on 4/21 and 4/22 in Akihabara, with the same seiyuu as today. Then the seiyuu came back, and there was a question session. The seiyuu was asked about their characters again. Nobuko said that her character Nagayama Shoko was a girl who doesn't show her feelings much. At the end of the event, the Kira Kira Melody Gakuen girls sang the ending song Moon. They used stand mikes, and stood left to right, Masumi, Sayaka, Sara, Mieko, Mae, and Nobuko.